Charles Augustin de Coulomb (14 June 1736 - 23 August 1806) was a French physicist, born in Angouleme, France. He chose the profession of military engineer, spent three years, to the decided injury of his health, at Fort Bourbon, Martinique, and was employed on his return at La Rochelle, the Isle of Aix and Cherbourg. In 1781 he was stationed permanently at Paris, but on the outbreak of the Revolution in 1789 he resigned his appointment as intendant des eaux et fontaines, and retired to a small estate which he possessed at Blois. He was recalled to Paris for a time in order to take part in the new determination of weights and measures, which had been decreed by the Revolutionary government. He was one of the first members of the National Institute; and he was appointed inspector of public instruction in 1802. However, his health was already very feeble, and four years later he died at Paris. Coulomb is distinguished in the history of mechanics and of electricity and magnetism. In 1779 he published an important investigation of the laws of friction (Theorie des machines simples, en ayant egard au frottement de leurs parties et a la roideur des cordages), which was followed twenty years later by a memoir on viscosity. In 1785 he presented his Recherches theoriques et experimentales sur la force de torsion et sur l'elasticite des fils de metal. This memoir contained a description of different forms of his torsion balance, an instrument used by him with great success for the experimental investigation of the distribution of charge on surfaces and of the laws of electrical and magnetic force, of the mathematical theory of which he may also be regarded as the founder. The unit of charge, the coulomb, is named after him. Charles Babbage proposed a Difference engine in a paper to the Royal Astronomical Society entitled "Note on the application of machinery to the computation of astronomical and mathematical tables." J. H. Metcalf discovered asteroid #600 Musa. John Alcock and Arthur Whitten Brown departed from St. John's, Newfoundland, on the first nonstop transatlantic flight. C. Jackson discovered asteroid #1490 Limpopo. The first commercially produced electronic digital computer, UNIVAC 1, entered service at the US Census Bureau. USSR launched Vostok 5 with cosmonaut Valery Bykovsky aboard, the fifth spacecraft in the USSR manned flight series, on a flight originally intended to be eight days long. Vostok 5 (callsign Yastreb - "Hawk"), the fifth spacecraft in the USSR manned flight series, was launched on 14 June 1963, to study the effects of prolonged space flight on the human organism, for a tandem flight with Vostok 6, and for improvement of spacecraft equipment and pilotage. (Some NASA records mistakenly list the launch date as 15 June.) The spacecraft consisted of a nearly spherical cabin covered with ablative material, three small portholes, and external radio antennas. Radios, a life support system, instrumentation, and an ejection seat were contained in the manned cabin. The cabin was attached to a service module that carried chemical batteries, orientation rockets, the main retro system, and added support equipment for the total system. The service module was separated from the manned cabin on reentry. Vostok 5, piloted by cosmonaut Lt. Col. Valery F. Bykovsky, was relatively unsuccessful. The launch was delayed repeatedly due to high solar activity and technical problems. Intended to be in orbit for a record eight days, Vostok 5 had troubles from the start. It was finally forced down after five days in space, landing northwest of Karaganda on 19 June 1963, after making only 81 orbits about the Earth; the mission still set a Soviet manned duration record of 119 hour 6 minutes. Problems encountered during the flight included the spacecraft ending up in a lower than planned orbit; the elevated levels of solar flare activity combined with the associated increased atmospheric activity to decay Vostok 5's orbit quickly; temperatures in the service module reached very high levels; a problem with the spacecraft's waste collection system, possibly a spill, made conditions "unpleasant" in the capsule; and, as on Vostoks 1 and 2, the reentry module failed to separate cleanly from the service module when it was time for Bykovsky to come home, such that wild gyrations ensued until the heat of reentry burned through the non-separating retraining strap. On 16 June 1963, Vostok 6 was launched, with Valentina Tereshkova (the first woman in space) on board. This was to be a joint mission with Vostok 5; the primary mission was to collect data on the effects of space flight on men and women. On the first orbit, Valentina came within roughly 5 km of Vostok 5, the closest distance achieved during the flight, and made radio contact with Bykovsky. Vostok 5 flew with Vostok 6 for 3 days (48 orbits), maintaining two way radio communications, and establishing communications with Earth at regular intervals. The space spectacular featured television coverage of Bykovsky that was viewed in the West as well as in Russia. N.B. : The NASA site incorrectly reports the launch date as 15 June, which is also inconsistent with its five day duration ending on 19 June. NASA launched the Mariner 5 flyby mission to Venus. The Mariner 5 spacecraft, launched 14 June 1967 from Cape Canaveral, Florida, was the fifth in a series of spacecraft used for planetary exploration in the flyby mode. Mariner 5 was a refurbished backup spacecraft for the Mariner 4 mission, and was converted from a Mars mission to a Venus mission. The spacecraft was fully attitude stabilized, using the Sun and Canopus as references. A central computer and sequencer subsystem supplied timing sequences and computing services for other spacecraft subsystems. With more sensitive instruments than its predecessor, Mariner 2, Mariner 5 was able to shed new light on the hot, cloud-covered planet, and on conditions in interplanetary space. The spacecraft passed 3,990 km from Venus on 19 October 1967. The spacecraft instruments measured both interplanetary and Venusian magnetic fields, charged particles, and plasmas, as well as the radio refractivity and UV emissions of the Venusian atmosphere. The mission was termed a success, and Mariner 5 operations ended in November 1967. USSR launched Luna 1969C (Ye-8-5 s/n 402) in an attempt to return Lunar soil to Earth, 'scooping' the Americans' impending Apollo 11 mission. However, the Block D upper stage did not fire, and the payload did not even attain Earth orbit. Luna E-8-5 No.402 (Luna Ye-8-5 No.402), initially identified by NASA as Luna 1969C, launched 14 June 1969 from Baikonur on a Proton booster, was an attempted Lunar sample return. The Ye-8-5 sample return apparatus ("Moonscooper") consisted of a descent stage 3.96 m diameter at the base containing retro-rockets, instrumentation and fuel tanks for landing as well as a robot arm. On top of this was a cylindrical instrumentation unit. An ascent stage was on top of this, consisting of ascent rockets and a sphere-shaped sample return compartment with a hatch into which the robot arm could place Lunar samples. The entire assembly was 3.96 m high and weighed 1880 kg. This was another attempt to launch a Ye-8-5 to return Lunar soil to Earth ('scooping' the Americans' impending Apollo 11 mission), and yet another UR-500K launch failure. This time, the UR-500K booster functioned perfectly, but the Block D upper stage did not fire, and the payload did not even attain Earth orbit. Every UR-500K launch cost the Soviet state 100 million rubles, and this failure basically ended the chances for the Russians to trump the American Moon landing. The Tass news agency began running stories the day before to "prepare the masses" for the upcoming Apollo 11 triumph, the party line being that the Soviet Union was not about to risks the lives of its cosmonauts on flights to the Moon, when automated probes could safely retrieve soil for study on Earth. USSR launched the Venera 10 lander to Venus, which became the second spacecraft to return pictures of the surface. 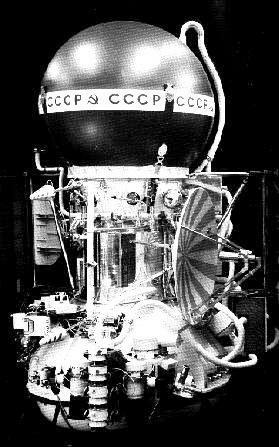 USSR launched Venera 10 from Baikonur on 14 June 1975, which entered Venus orbit and was separated from the lander on 23 October 1975. The orbiter served as a communications relay for the lander, and explored cloud layers and atmospheric parameters. Its instruments included a French 3500 angstrom UV photometer, a 4000-7000 angstrom photo-polarimeter, a 1.5-3 micron infrared spectrometer, and a 8-30 micron infrared radiometer. The orbiter also carried a magnetometer and charged particle traps. Some reports indicated a camera system was also aboard. The orbiter consisted of a cylinder with two solar panel wings and a high gain parabolic antenna attached to the curved surface. A bell-shaped unit holding propulsion systems was attached to the bottom of the cylinder, and mounted on top was a 2.4 m sphere which held the lander. The descent craft/lander comprised a spherical body mounted by a series of struts on a toroidal landing platform and topped by a disk (the titanium aerobrake) and a cylindrical tower. The full entry probe, which included a 2.4 m aluminum heat shield and held the descent craft, had a mass of 1560 kg. The lander was 2 m high and had a mass of 660 kg. Data transmission would be at 256 bits/sec, through a helical antenna wrapped around the upper cylinder using the orbiter as a relay. It carried a panoramic imaging system mounted 90 cm above the base, a thermometer, barometer, anemometer, mass spectrometer, photometers, nephelometer, gamma-ray spectrometer, radiation densitometer, and accelerometers. Venera 9 and 10 were the first probes to send back black and white pictures from the Venusian surface. They were supposed to make 360 degree panoramic shots, but on both landers one of two camera covers failed to come off, restricting their field of view to 180 degrees. E. Bowell discovered asteroid #2937 Gibbs, #2938 Hopi and #3160 Angerhofer. USSR launched the Gorizont 4 communications satellite from Baikonur, which was positioned in geosynchronous orbit at 14 deg W in 1980-1984; 11 deg W in 1984-1985; 14 deg W in 1985; 11 deg W in 1985-1988. The QM-7 full-scale/full-duration test firing of NASA's redesigned shuttle solid rocket booster (SRB) motor was performed, the fourth of five tests required before the Return To Flight (RTF) mission conducted in September in which Discovery flew to space. 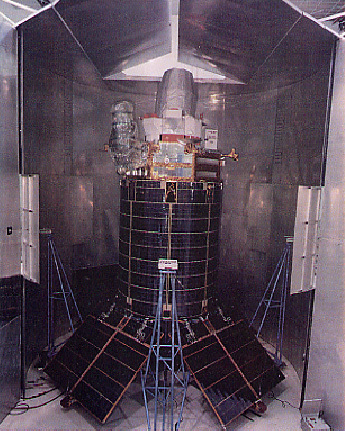 With the first Titan 4 launch, the US Air Force lofted the USA 39 DSP Block 14 Early Warning spacecraft into orbit, which was then positioned in geosynchronous orbit at 165 deg W in 1990-1994, and at 145 deg W in 1999. NASA's STS 40 (Columbia 11, 41st Shuttle mission) landed at Edwards AFB after carrying the Spacelab Life Sciences-1 experiment package to orbit. The launch of STS 40 was originally set for 22 May 1991. The mission was postponed less than 48 hours before launch when it became known that a leaking liquid hydrogen transducer in the orbiter main propulsion system which was removed and replaced during a leak test in 1990, had failed an analysis by the vendor. Engineers feared that one or more of the nine liquid hydrogen and liquid oxygen transducers protruding into the fuel and oxidizer lines could break off and be ingested by the engine turbopumps, causing engine failure. In addition, one of the orbiter's five general purpose computers failed completely, along with one of the multiplexer demultiplexers units that control the orbiter hydraulics ordnance and orbiter maneuvering system/reaction control system functions in the aft compartment. A new general purpose computer and multiplexer demultiplexer were installed and tested. One liquid hydrogen and two liquid oxygen transducers were replaced upstream in the propellant flow system near the 17-inch disconnect area, which is protected by an internal screen. Three liquid oxygen transducers were replaced at the engine manifold area, while three liquid hydrogen transducers there were removed and the openings plugged. The launch was reset for 8 am EDT on 1 June, but postponed again after several attempts to calibrate inertial measurement unit 2 failed. The unit was replaced and retested, and launch was rescheduled for 5 June. STS 40 was then successfully launched 5 June 1991. STS 40 was the fifth dedicated Spacelab mission, Spacelab Life Sciences-1, and first dedicated solely to life sciences, using the habitable module. The mission featured the most detailed and interrelated physiological measurements in space since the 1973-1974 Skylab missions. The subjects were humans, 30 rodents and thousands of tiny jellyfish. The primary SLS-1 experiments studied six body systems; of 18 investigations, ten involved humans, seven involved rodents, and one used jellyfish. The six body systems investigated were cardiovascular/cardiopulmonary (heart, lungs and blood vessels); renal/endocrine (kidneys and hormone-secreting organs and glands); blood (blood plasma); immune system (white blood cells); musculoskeletal (muscles and bones); and neurovestibular (brains and nerves, eyes and inner ear). Other payloads carried by STS 40 were twelve Get Away Special (GAS) canisters installed on the GAS bridge in the cargo bay for experiments in materials science, plant biology and cosmic radiation; Middeck Zero-Gravity Dynamics Experiment (MODE); and seven Orbiter Experiments (OEX). STS 40 ended on 14 June 1991 when Columbia landed on revolution 146 on Runway 22, Edwards Air Force Base, California. Rollout distance: 9,438 feet. Rollout time: 55 seconds. Launch weight: 251,970 pounds. Landing weight: 226,535 pounds. Orbit altitude: 157 nautical miles. Orbit inclination: 39 degrees. Mission duration: nine days, two hours, 14 minutes, 20 seconds. Miles traveled: 3.8 million. The orbiter was returned to the Kennedy Space Center on 21 June. The flight crew for STS 40 was: Bryan D. O'Connor, Commander; Sidney M. Gutierrez, Pilot; James P. Bagian, Mission Specialist 1; Tamara E. Jernigan, Mission Specialist 2; M. Rhea Seddon, Mission Specialist 3; F. Drew Gaffney, Payload Specialist 1; Millie-Hughes Fulford, Payload Specialist 2. The Japanese space probe Sakigake ("Pioneer") made its second pass by Earth, at a distance of 40 Earth radii, on its planned journey to two more comets after passing Comet P/Halley on 11 March 1996. Russia launched the Foton 9 microgravity experiment satellite from Plesetsk on a mission that lasted 17.56 days. Leonid Denisovich Kizim (5 August 1941 - 14 June 2010) was a Soviet cosmonaut who flew on three space station missions: Salyut 6 (over 12.75 days), Salyut 7 (nearly 237 days), and Mir 1 (125 days). He was a member of the first crew to fly between two space stations in one mission, traveling in Soyuz T-15 between Mir and Salyut 7.